Moonee Ponds, between Flemington and Essendon, is a residential area 7 km north-east of central Melbourne. The name comes from the Moonee Ponds Creek, expressed as the 'Mone Mone Creek' in an instruction given in 1837 by the government surveyor, Robert Hoddle, for a survey of the area. The creek was a chain of ponds in dry seasons. This would seem to be the most likely source of the place name, although claims have been made for Moonee Moonee, an Aborigine attached to the mounted police, and for an early Crown grantee, John Moonee, who had land near the Moonee Valley racecourse. When gold was discovered in the Castlemaine and Bendigo areas the main route to the diggings was Mount Alexander Road, through Moonee Ponds. 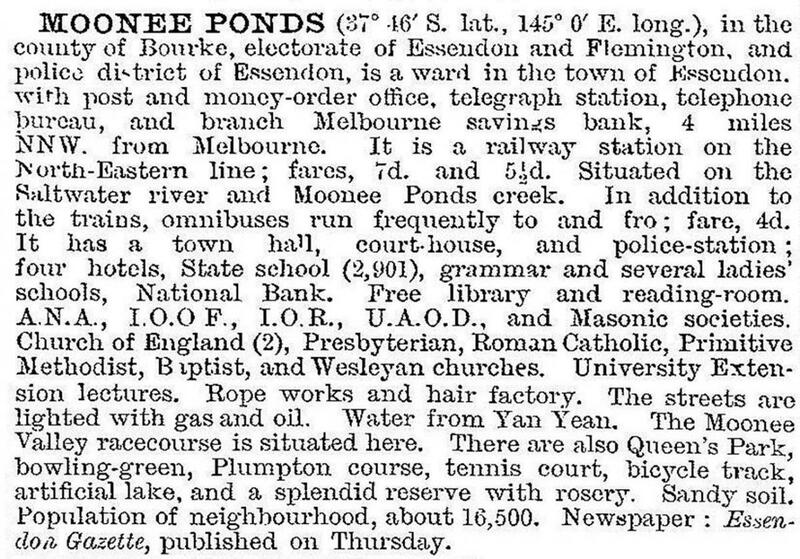 Shops and facilities were opened along the route, and the first night's stopover was usually in the vicinity of the water lying at today's Queens Park lake, Moonee Ponds, and near the Moonee Ponds hotel (1849). In 1860 a railway line from Melbourne to Essendon with a station at Moonee Ponds, was opened. However, the line, which was privately owned, closed between 1864 and 1871, before recommencing as a government railway. Until the early 1880s Moonee Ponds was typified by farms, a few businesses and hotels along Mount Alexander Road, St Thomas' Anglican church (1849) and a police station. In 1881-83 several subdivisions were offered for sale, the best one being the Whitaker Estate (1882) on the north side of the future shopping centre in Puckle Street. The street was named after the first vicar of St Thomas', Edward Puckle, who came there in 1858, ten years after the first Anglican services were conducted in Moonee Ponds. Around the corner from Puckle Street, on a V-shaped site bounded by Mount Alexander and Pascoe Vale Roads, the Essendon and Flemington Institute (or Athenaeum) built an elaborately designed building in 1880, sufficient to attract as its neighbour the Essendon town hall two years later. This placed much of the district's focus on Moonee Ponds. By 1891 Moonee Ponds had over one third of the population and dwellings from Ascot Vale to Essendon. Ascot Vale, closest to Melbourne, had about half. In 1881 Puckle Street had five addressees in the suburban directory, and in 1891 it had fifty businesses listed, plus a Wesleyan church (1891). Twenty years later there were nearly ninety businesses (mostly retail), and the Methodist church and Sunday school hall. By 1906 the tram service along Mount Alexander Road had been extended from the Moonee Ponds Creek to Keilor Road, giving the Puckle Street shops a tram stop at the east end and a railway station at the other. A tramline ran along Puckle Street from 1906 to 1922. About 0.5 km east of the Essendon town hall the Moonee Valley racecourse was opened in 1882. It succeeded Kensington Park racecourse, near the Kensington railway station, and the promoter, William Cox, has his name commemorated by the W.S. Cox Plate, an important race during the Spring racing carnival. The rope works referred to in the extract above were Kinnears, on which part of Queens Park was laid out. Kinnears Rope Works moved to become a landmark in Footscray. Moonee Ponds during the 1920s-30s became best known for the Puckle Street shopping centre. Its growth continued in the 1970s and beyond as drive-in facilities and large self-service stores were built behind the shopping strip. The strip's compactness saved it from being eroded at potentially vulnerable points by the larger stores, and the creation of a pedestrian mall has successfully kept shoppers in the strip. Moonee Ponds' other claim to notoriety was the creation of the fictional Edna Everage by the satirist Barry Humphries. Reflecting suburban behaviour supposedly redolent of the red brick and weatherboard Moonee Ponds environment, Humphries satirised Australian suburban society for several years before making Edna a Dame, elevating her from suburban to metropolitan awfulness. Everage Street (1979) runs beside a carpark at the back of Puckle Street. Moonee Ponds second primary school, originally a central school, was opened near the racecourse in 1919. A hospital for the Essendon District was first thought about in the 1890s, but remained beyond reach until one was opened west of Puckle Street in 1980. Public parkland in Moonee Ponds is at either end, adjoining the Maribyrnong River (Aberfeldie Park) and the Moonee Ponds Creek (Ormond Park). The former courthouse (1890) and the infant room (1911) at the Moonee Ponds West school are heritage listed. The Ascot Vale Uniting Church (1896) in Moonee Ponds was destroyed by arson in 2004.